As a jazz critic I find myself a man of simple pleasures. I enjoy lyrically driven and harmonically adventurous post modern jazz, Kentucky bourbon and musical irony. While my short stay as a contributing critic for All About Jazz was something far less than pleasant, I reviewed one of the finest modern jazz vibraphone players in Tim Collins. I later interviewed Tim Collins for my site. A few days ago guitarist Peter O'Mara contacted my office to inquire about the possibility of reviewing his stellar new release My Time. I now owe Tim Collins a huge debt of gratitude while over the past month A.A.J has reeled off reviews from the rock bands Yes and Little Feat both having long been on the rock and roll scrap heap for years. In the spirit of making lemonade out of lemons O'Mara is now the fourth artist that has contacted my office after my not so amiable split with A.A.J. and in doing so offers up one of the very finest releases for 2012. This Australian six string wonder has been living in Munich since 1982. Having numerous friends living in Munich and Cologne Germany, I am well aware of the vibrant jazz scene which may rank a close second to New York when considering the depth and virtuoso skill the area artists are able to bring to the studio or concert hall. The artistic community in Germany is however slightly more artist friendly but that is a topic for another time. Six of the ten tracks are O'Mara originals with some slightly eclectic standards tossed into the mix to keep things fresh and moving. The lyrical sense of purpose is perfectly captured with the opening tune "It Never Entered My Mind." The Rogers and Hart classic is slightly reharmed into a free flowing ballad with Tim Collins solo adding a harmonic flavor that is rich in texture and color while blending perfectly with this stellar 4tet. The subtle nuances from the rhythm section rounded out by contrabass player Henning Sieverts and Matthias Gmelin are done with the type of finesse and elegance necessary to keep the integrity of this beautiful tune. "Round Midnight" can be a musical trip wire for some artists if they are unable to channel the raw emotion or connectivity necessary to tug at the heartstrings of a listener. O'Mara nails this tune as though he has played it from day one of his career. Clean single note lines with the lyrical bass of Sieverts and deceptively subtle brush work of Gmelin make this tune far more than the average cover but rather an emotional trip back to the future for the jazz aficionado that lives for tradition. O'Mara's riff on Herbie Hancock's "Dolphin Dance" has an intriguing buoyant quality despite being a tune done mid tempo. The ability to shift meter as well as dynamics on the fly is an immediate head turner. O'Mara has the ability to work without a harmonic net and more than ample chops to take this tune back up a notch when necessary. Drummer Gmelin along with the entire rhythm section does not own the pocket here, they are the pocket with a deceptively subtle swing bordering on infectious. One of O'Mara's two best originals are saved for last in "Last Chance" which has the slight musical frame of reference of early Pat Metheny meets John Abercrombie but the key to success is that O'Mara establishes his own voice. Tim Collins drops in with a sonic exploratory of a solo as the ensemble begins pushing the musical envelope with the proficiency of a working band that has been together twenty years. The other original saved to close out this remarkable release is "Movin On" which allows the music if not the release itself to come full circle. While O'Mara is a formidable composer, were it not for a solid working knowledge of the material here one could easily mistake "Movin On" as a standard in waiting and something tells me it could very well be. I have reviewed over a dozen guitarists thus far with Peter O'Mara rising head and shoulders above the pack. A dynamic 4tet with exquisite song selection and the virtuoso talent to move effortlessly throughout each tune, the aptly titled "My Time" is merely an introduction of a stellar talent whose musical stock should be an arrow pointing straight up. If anything I owe All About Jazz a debt of thanks. Were it not for meeting vibraphonist Tim Collins then I too may be reviewing the same geezers of rock they find themselves working now. Easily a five star release and one of the best for 2012! Tracks: It Never Entered My Mind; Sizzle; Waltz For Vivien; Maratime; Round Midnight; Crossing Over; Dolphin Dance; I Concentrate On You; Last Chance; Movin On. 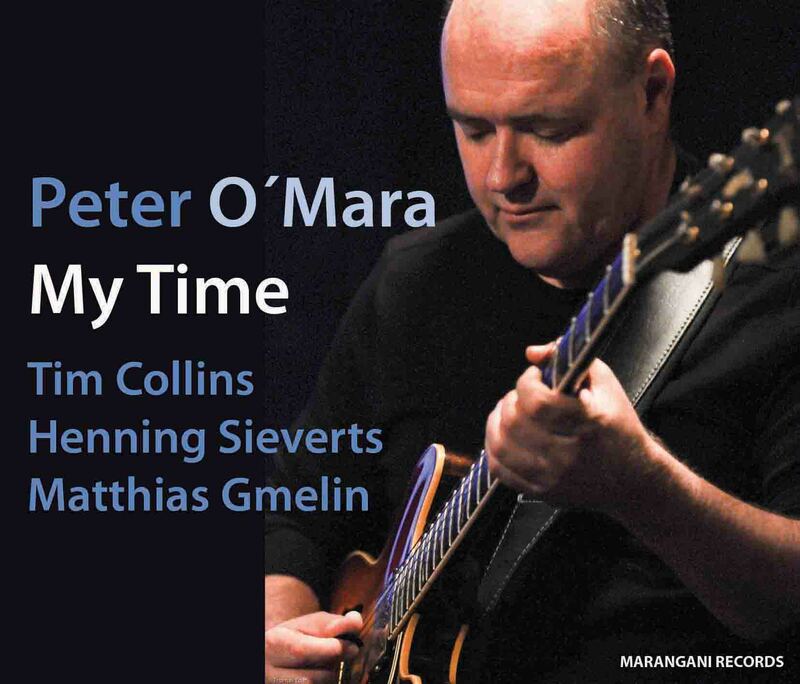 Personnel: Peter O'Mara: guitar; Tim Collins: vibraphone; Henning Sieverts: contrabass; Matthias Gmelin: drums.